Purple Line construction is now well underway in Montgomery County, and neighbors can expect some significant impacts over the next four years. “We are cheek to jowl next to neighborhoods for pretty much the entire length of the project," the spokesman for the major construction project says. WASHINGTON — Squeezing a train through neighborhoods just feet from homes creates some issues during construction, but when the Purple Line is complete between New Carrollton and Bethesda, it promises significantly faster and more accessible trips for thousands of people in the region. Nearly a year after a groundbreaking that had been held up by a lawsuit, hundreds of workers were spread across the length of the approximately $2 billion 16-mile project that will connect New Carrollton, College Park, Silver Spring and Bethesda by 2022. A majority of the 21 stops are from the University of Maryland through Silver Spring. In Silver Spring, purple construction sound walls behind a Giant grocery store shielded a group of row houses from work just a few yards away from their front doors. Crews are working on a tunnel there in what will be the middle of the line. “We’ve got to drill through rock and earth right underneath the neighborhood for about a third of a mile,” Purple Line Transit Partners spokesman John Undeland said as construction vehicles moved back and forth on the site. The tunnel from Flower Ave. and Arliss St. just off Piney Branch Road will run to Wayne Ave, where it will emerge directly between two large apartment buildings. At that end, retaining walls have been put in place as the tunnel work continues from the other side. “We are cheek to jowl next to neighborhoods for pretty much the entire length of the project, so it’s tough. And folks can expect some significant impacts for the next four years,” Undeland said. Crews have tunneled about 150 feet, putting up rebar that gets sprayed with concrete to support the hole created by the noisy machine hammering through the rock and soil. Tunneling began earlier this summer, and is expected to run through spring. At times, that could require blasting. Neighbors would get at least one day’s notice. Along the corridor, work is generally planned from 7 a.m. to 5 p.m. Monday through Saturday, although there is overnight work in a number of spots. The project is required to stay within vibration and noise thresholds, but that is not always enough for neighbors living within a few feet of construction. “It is inherently impactful work, we’re just asking for the neighbors’ patience as we go about this somewhat intrusive … transformational project,” Undeland said. Significant development is expected near stations along the line. “It’s going to connect the region like no other project has …(but) there is going to be some pain along with getting that ultimate gain,” he added. Purple Line Transit Partners is the private company building and operating the Purple Line for the state of Maryland. Both the state and the company still hope to open the line in 2022. That requires an accelerated construction schedule due to the lengthy delay tied to a court challenge that is still not technically completely over. “That ship has sailed. We don’t anticipate any obstructions of that kind. We’ve got plenty of physical obstructions. We don’t anticipate any further legal obstructions to getting this project done,” Undeland said. The first light rail vehicles could run on test tracks as soon as 2020. They are expected to average 20 mph, but are capable of a top speed of 50 mph. The Purple Line will connect to the Metro system at New Carrollton, College Park, Silver Spring and Bethesda, but it will not be a part of WMATA. It is expected to accept SmarTrip cards or a similar payment method. Exact fares have not been set. 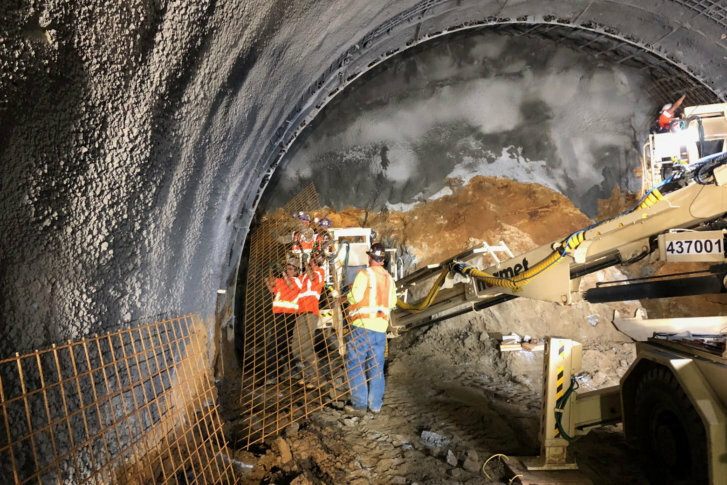 In Bethesda, the project requires a large shaft to the surface at Wisconsin Ave. and Elm St. that will be used to connect the Purple Line and Metro’s Red Line platform. In Lyttonsville, crews have taken down a bridge that is being replaced as part of construction, leading to detours for the next few months. Pile driving is getting underway for the new bridge. Not far from the New Carrollton Metro, work continues on the maintenance facility off Veterans Parkway near the Glenridge shopping center. In Riverdale Park, a lane on East-West Highway is closing between Kenilworth Ave. and Mustang Drive, and other work is underway near the Baltimore-Washington Parkway entrance. The project is also rebuilding the trail along part of the route that has been closed for construction. There is no set date for the new Capital Crescent Trail and Georgetown Branch Trail to reopen, and it could remain closed throughout the construction period. In College Park and along the trail especially, the work has taken down a number of large trees to create space for the overhead power lines that will power the light rail vehicles and for construction activity on either side of the rail line and rebuilt trail.